This autumn, Cleanhouse has started management in Nursery School Bitīte in Katlakalns, Ķekava district. This building is notable by the fact that it is the first, consequently, unique public-private partnership project in Latvia. This Nursery School has been created by ĶekavaĶekava Administrative District Council in cooperation with several companies that provide construction works and management. The agreement on public-private partnership is signed for construction and management in total of four Nursery Schools. It will result in new nursery schools not only for locals in Ķekava district, but also in Tukums and Ogre districts. Within this Project, also Nursery School in Mārupe is already put into operation. The contractor representing service providers is general partnership ACANA, which unites construction companies Arčers and Abora, and facility management companies Cleanhouse and Namu apsaimniekotājs. The total term of this agreement, including construction, is 20 years. During this period, companies will ensure facility management and other necessary activities for wholesome functioning of the building, as well as general renovation of facilities one year prior to transferring the Nursery School under full management of local council. Within the frame of this collaboration, Cleanhouse will ensure facility management: take care of cleaning works, security services, supply of necessary equipment, maintenance of technical conditions and organization of catering services. 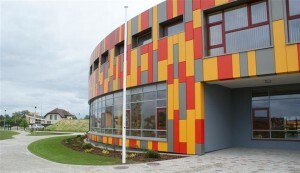 Nursery School Bitīte in Katlakalns is one of the most ambitious buildings in Ķekava District. In total it can admit approximately 260 children in 12 groups at the age from three to seven years. The total area of facilities is 3.472 m2.